Valentine's Day. The cinema has to be one of the most popular options, and that certainly proved to be the case, with Cineworld, Bolton, newly-crowned Most Loved Cinema in the UK, full of loved-up couples. 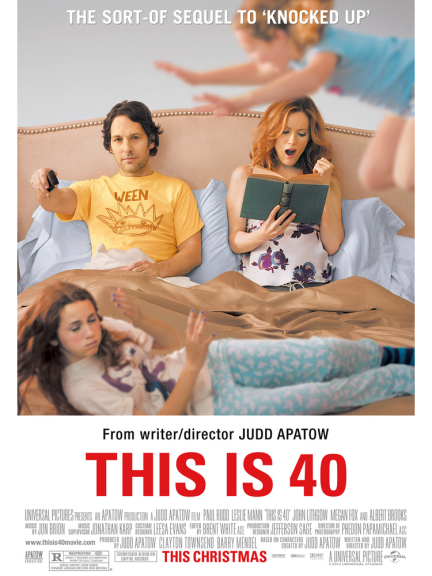 And what better film to watch than laugh-out-loud comedy, This Is 40. This Is 40 is a coming of age story, but that age is the often-contentious milestone of 40. It follows Debbie (Mann) and Pete (Rudd) as they both reach that particular birthday, with the latter dealing much better with it. To many, they have the desired ideal, great jobs, a stunning home, two daughters, everything society says we should strive for. But it's never that easy, and the stress from it all starts to tell on them all. Not only has Pete resorted to using viagra, but his music business is starting to fail, someone has stolen $12,000 from Debbie's clothes store, and the couple's daughters Sadie (M. Apatow) and Charlotte (I. Apatow) are fighting like only siblings can. It starts to become a struggle between the two, and it soon becomes apparent that this is the biggest test to their relationship. Can they weather it, especially with all the other problems going on? The characters of Pete and Debbie may seem familiar. They may look familiar. Think, where have you seen them before. Well, we last saw them in the hugely-popular and successful Knocked Up, where they really played second-string to Seth Rogen and Katherine Heigl. But here they are in the starring roles, along with some of the other favourites from Knocked Up; Debbie's trainer, Jason (Jason Segel), Debbie's employee, Jodi (Charlyne Yi) and Debbie's gynecologist, Dr. Pellegrino (Tim Bagley). Also present are the couple's children Sadie and Charlotte. It's a nice little reunion between all the characters, and tells their story well following Knocked Up. It is, however, a stand-alone sequel, so don't worry if you haven't seen the previous installment, you'll want to after this. There is a lot going on in This Is 40, a lot of it very relatable. It is well written, well directed, and well acted. As a comedy, you'd expect laughter, and there is plenty of that to be had. Some of it slightly low-brow, a lot of it very low-brow. Rudd and Mann have great chemistry in the lead role. But, in my opinion, the spotlight is stolen by the two daughters, Sadie and Charlotte. Both are excellent, though this is perhaps to be expected. Their career paths were pretty much determined before birth, being the children of director, producer and writer Judd Apatow, and also of lead actress and fictional mother Leslie Mann. You'll find yourself laughing at This Is 40 despite the couple actually goign through a pretty dark time in their relationship. It is laugh out loud funny in several places, especially with the phenomenal cameo from comedy stalwart Melissa McCarthy. If you're looking for a funy film to watch at the moment, this is definitely that. (Though, maybe be slightly wary of the 15 certificate, with strong language and strong sexual references fairly frequent. Oh, and maybe don't go see it with the parents).